Naturally, the truth about feeling extends to the nonprofit world. It extends to any space where humans deal with each other. Nonprofits are made up of humans, and their respective donor bases consist of humans, too. If you took a good, hard look at some of the nonprofit communications out there — pieces they send to their donors by email, snail mail, or some combination of both — you might not know it, though. Because it’s almost as if sometimes, they forget who they’re dealing with. And, while matching gift opportunities nearly always add a boost to your fundraising results, it can be challenging to get past it being all about YOU. 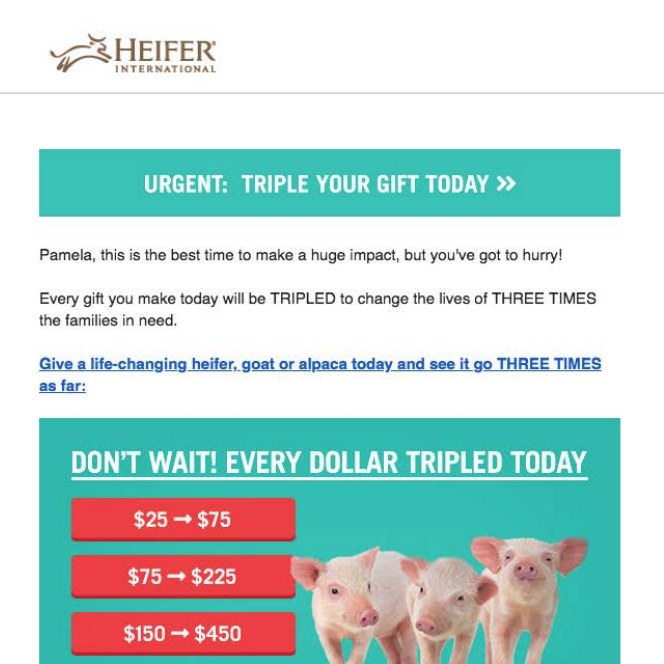 Luckily, Heifer International doesn’t, and this recent email from them is proof. When I opened it, the heading and message instantly evoked Maya’s words. The piece capitalizes on human feeling in a catchy, clever way: three times your donation (and impact!) equals three times the good feeling. I felt good reading this, and not just because of the baby pigs. The urgency is there, too, as this special offer to triple impact is on for a limited time. The plan here is that if you buy one animal to support a family, you’re buying two animals to support two families. A two-animal donation will support six families. And so on. But the cycle goes beyond that, too. Because each animal who gives birth will provide an offspring for yet another family. Pretty cool. Check it out below, and the next time you send out an email or a fundraising appeal letter, think hard. What are you doing to make your donors feel good? How can you keep them coming back? (tweet this!) Remember: when you give your donors good feelings, you’re giving them something to remember you by.